If you knew when people lied? If you knew when they had personal problems, like a husband-wife fight? This is a page all in good fun, but I do believe I was born lucky. If you could have super empathy for other people? You could avoid most problems in life; or be emotionally tortured. "Being that I am Betazoid, I realized he was lying." Long-term readers slowly recognizes me alluding, and explaining myself as a Betazoid. This is a little sub-story, within a story, and this is confusing to new readers. Here is a famous Betazoid, I think of her as one of my sisters. This is the "About Andy Lee Graham" section of HoboTraveler.com. IF you want, you can read many things about me, Andy Lee Graham the founder and lead travel writer for this site. OK - Back to the explanation of Andy Graham the Betazoid. I am a travel writer; and readers often make extremely expensive travel decisions because of my opinions. Therefore, I want you the reader to know who I am, how I think, my value, moral, and lifestyle, so you know when my point of view differs, and when we coincide. I want tourist and travelers to make the best decisions that allows them to enjoy their life as they wish. What is a Betazoid to me, Andy Graham? "What is the enemy ship commander feeling?" 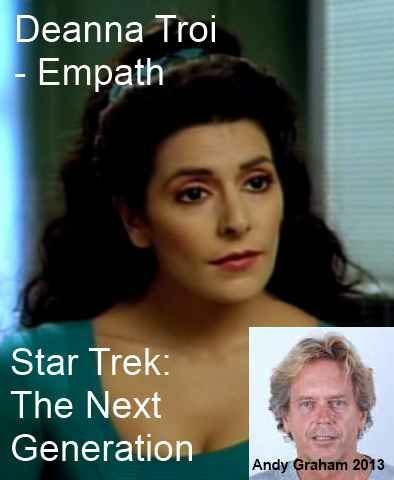 Deanna Troi was "SUPER sensitive" to peoples emotional status, she knew when they was happy, unhappy, or even being dishonest. I Andy Lee Graham make 95 percent of travel decision on how I feel. "Andy, you think to much,"
but in reality, I think I feel too much, I feel like an empath, as if the whole world is pushing their emotions upon me, I am super, radically sensitive. Writing a daily travel journal allows me to understand my own feelings, these overwhelming rushes, this torture of my emotions. I often know a person is lying, and just eat my feelings, I am not just thinking they are lying, I feel 99 percent sure. The way people talk to me, the tone of voice, the cadence, the body language screams at me, I cannot ignore it, it is torture to me. When a person is extremely sad, I must avoid them, or I become sad, there is no seperation between them and me, I feel empathy that is close to impossible for me to shut off, I do so, by leaving them. Why is being an empath, a Betazoid helpful as a traveler? Each week or two I rent a room in a new Hotel, and my number one priority is security, and in 15 years of perpetual travel, living in over 1000 Hotels, and 90 countries as of 2013. I have never been robbed by the Hotel staff, or inside the room. No girl or friend that has come to visit has stolen a camera, or computer, or just snatched small money. Why? Because like Captain Jean-Luc Picard, I enter a Hotel, and I am instantly insulted, tortured, there is an emotional onslaught if the management and staff is never to be trusted. I know when they are looking at me for ways to rob me, and say no, and enter a new Hotel. People that have many secrets, and shame, and want their secrets to remain secret avoid me, this type of person feels unsafe. Often they like me, as I understand their pain, frustrations, and problems, then one day realize that I know too much. The best thing to know when traveling the planet, is to know much about the people to know their basic motivations, wants and dreams. I often know when the Hotel staff is hiding the best room from me, and persist until I find it, they like to rent the worst ones first to insure full occupancy. I am grateful for you introducing me to this phrase, "Spirit of Discernment," it helpful and I thank you. Sometimes I believe I travel to stop the noise made by other people in my head, sometimes it is the search for nobility, with little to be found. Yet I learn each day to accept people more, and make no attempt to change them, and leave my opinions and thoughts off the table until they are wanted. Again thank you, it is a nice day.